Under pitch black skies and bright stadium lights, the San Diego Surge participated in a Wednesday night practice at Santana High School. 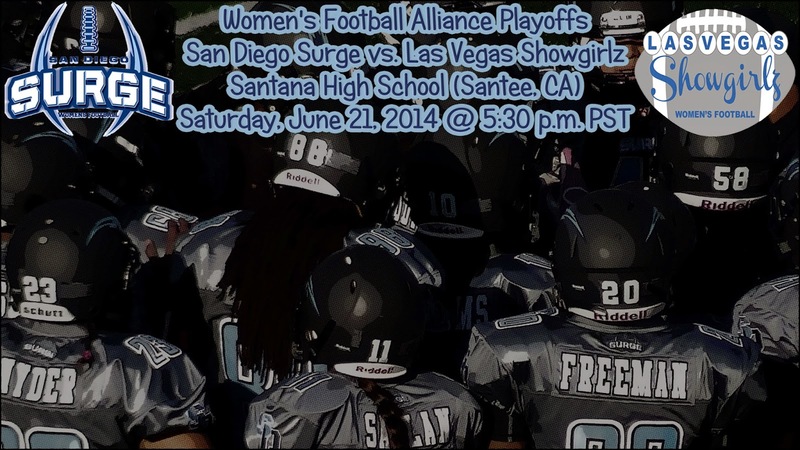 The team was preparing for it's upcoming playoff game against the Las Vegas Showgirlz, taking place on the same field this Saturday. "Vegas is coming to knock us out of the playoffs," Surge head coach William Harris yelled out while his players hustled through various conditioning drills. "It's win or go home!" The Surge finished the regular season with a perfect 8-0 record while outscoring their opponents 445-18, but it could be all for nothing if they don't take care of business on Saturday. "We have a number of players who were with us in 2011 when we loss to Boston in the championship," Harris said. "I think they’ve done a good job of letting it spread throughout the entire organization that you could have a great season and have one bad game at this point, and it’s over." Led by head coach Dion Lee, the Showgirlz have been on a roll since starting the season 0-2. They won their first round matchup with the Everett Reign 50-0 last week and will look to extend their seven-game win streak. To do that, they'll need to beat the Surge for the first time in team history. "Dion concerns me just because I know that he puts in the work that most other coaches won't," said Surge assistant coach Mark Ring. "It wouldn't surprise me if he was just preparing for us the entire season." The last time these teams met, quarterback Melissa Gallegos threw for five touchdowns to help the Surge pick up a 59-6 win in the season opener. She went on to finish the season with 21 touchdown passes while the Surge averaged 63.4 points per game, a team regular season record. One of Gallegos' top targets of the season was all-purpose threat Deana Guidry. The first-team All-American selection found the end zone 18 times this season as a rusher, receiver, and returner. A four touchdown performance in her last outing against the Central Cal War Angels earned her WFA Top Performer of the Week honors. "What’s crazy is our offense haven’t reached it's full potential," Gallegos said. "We still got a lot to work on, but we’re doing pretty good so far." With only two touchdowns given up this season, the defense is doing pretty good themselves. They will need to continue winning battles at the line of scrimmage in order to contain dual-threat quarterback Nikki Johnson, while keeping the ball away from targets such as Carrie Walter and Sara Nehf. "We’ll both bring all our dogs out, and see who could come away with the win," Coach Harris added.